Strokes Gained statistics have revolutionised the way fans, media, and broadcasters discuss golf and how golfers evaluate their own games. The PGA Tour first published Strokes Gained data on their website in 2011 and have expanded their offerings several times since. Now the plugged-in golf fan, broadcaster, or professional can have a more accurate idea of what is driving success on Tour. In 2015, 15th Club expanded Strokes Gained to be offered on the European Tour – allowing non-PGA Tour golfers to track these detailed performance stats. We now know that Rory McIlroy gains nearly 1.25 shots advantage on the field with his drives over an average round, that Jordan Spieth’s great 2017 has been driven by #1 on Tour approach play, and that Rickie Fowler has had a career year on the greens (ranking #2 in SG: Putting). Individual golfers can track their strengths of weaknesses over time and measure their opportunities to gain on the field. These stats also help journalists craft their narrative of a player’s season, broadcasters explain how a player achieved his victory, and fantasy players or punters pick the best players to back each week. 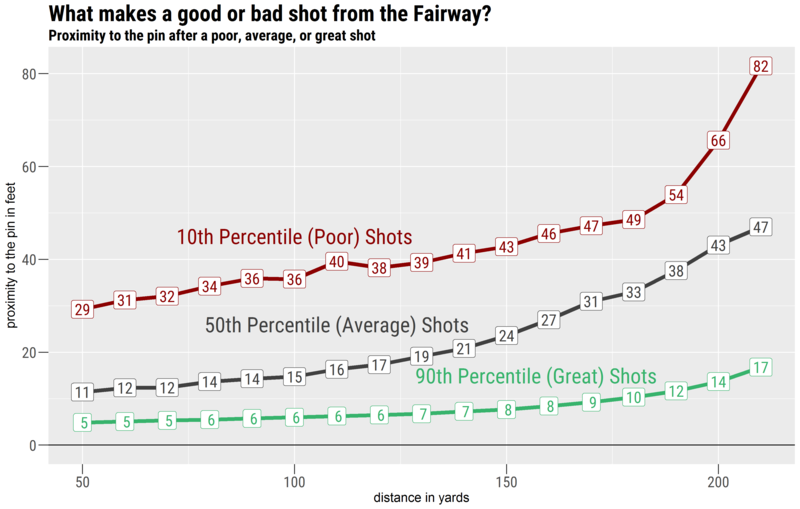 However, we still see some confusion around Strokes Gained – particularly in terms of what constitutes a good or bad shot and how much a particular shot is gaining a player on the field. The process of calculating strokes gained starts by collecting on-course data, feeding it through algorithms that compare each shot to the average result from that distance and lie, and adjusting for the course difficulty. What you see on PGATour.com is an aggregate of each shot presented as an average of strokes gained in a round. Lost in that average are individual shot outcomes. 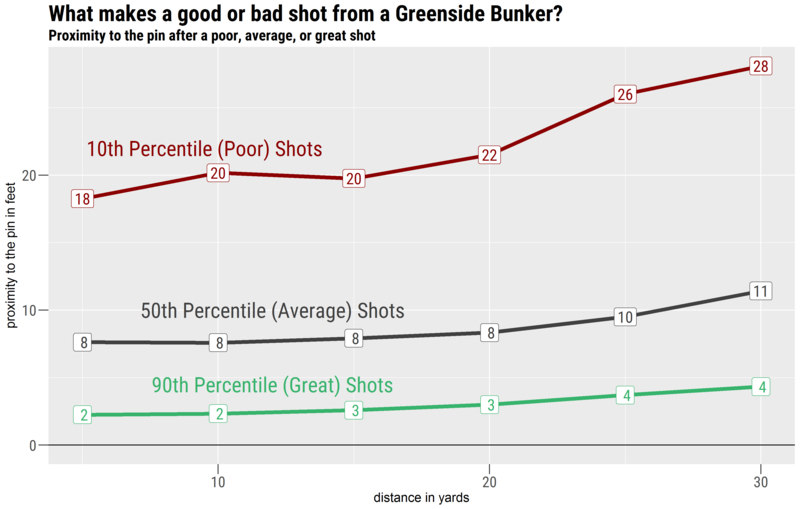 In the following graphs, we’ve broken down what the outcomes of a great, poor, and average shot are from four common lies: fairway approaches, rough approaches, greenside bunkers shots, and greenside rough shots. A great shot is one that is better than 90% of shots played from that location, a poor shot is one that is worse than 90% of shots played from that location, and an average one is the average shot played by a PGA Tour player from that location. A great shot gains roughly +0.40 SG and a poor shot loses -0.40 SG. Along the bottom of the graph are distances in yards from the pin and both the label and vertical axis show the proximity of the resulting shot to the pin. So on the first graph below for fairway approaches, the average shot from 100 yards is to 15 feet, a great shot is to 6 feet, and a poor shot is to 36 feet. So even though it looks like every wedge is stuck close on the TV broadcast, only one in ten are hit as close as 6 feet to the pin. You can also compare between groups by moving horizontally on the graph. For example, an average shot from 200 yards (43 feet) is the same as a poor shot from 150 yards (43 feet). 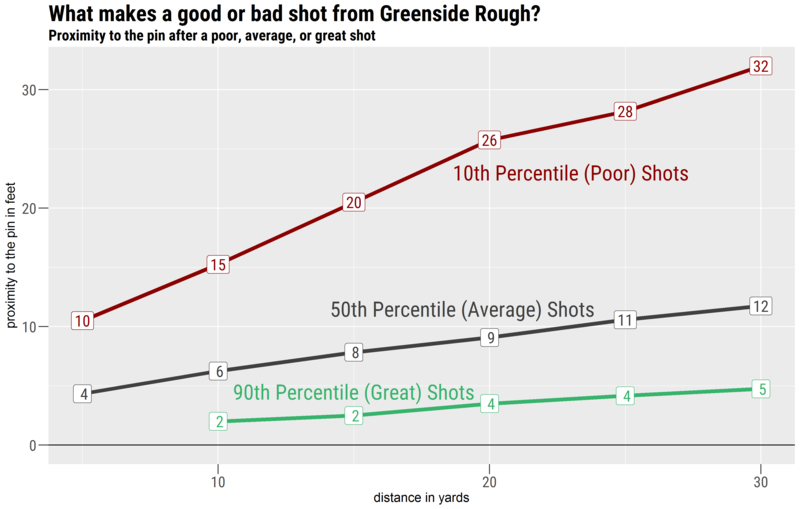 And comparing between graphs, you can see that greenside rough shots start off easier than greenside bunker shots on close shots (<10 yards), but increase in difficulty for the longest shots. 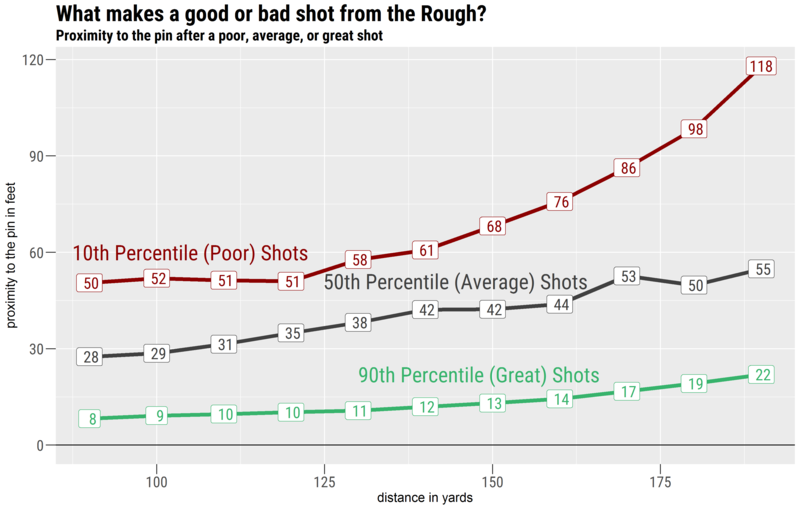 The margins in golf are so small when you examine performance on a shot by shot basis. A golfer who turns one average shot into a great shot per round can transform their career and standing on Tour. Improving by that much is worth roughly 50% higher earnings – so a golfer expected to earn €1 million per season would be expected to earn €1.5 million per season just by improving one average shot to be a great shot. How can a player gain that half stroke though? On the greens it’s an easy answer, make an 8 foot putt rather than missing. For a drive, it’s very unlikely to gain half a stroke on the field. A great drive is 25+ yards past the average drive and in the fairway. That will gain about +0.20 SG on the field. So every time Rory McIlroy or Dustin Johnson launch one 320 yards in the fairway they’re gaining about +0.20 to +0.25 SG on the field. For approach shots and shots around the green the answer is more nuanced. 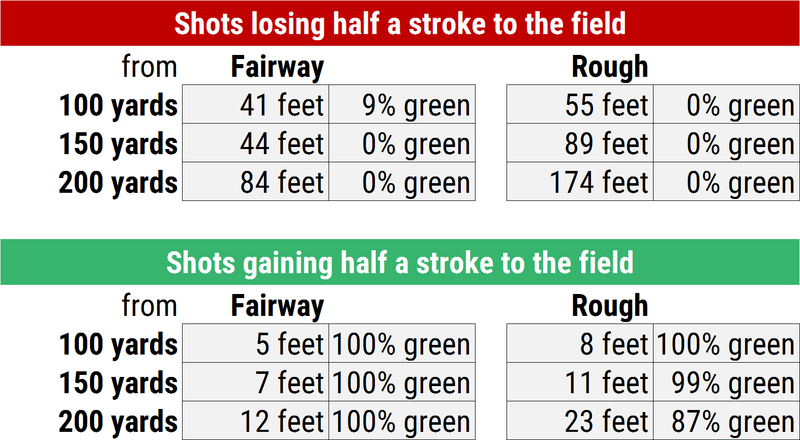 Below is a table showing how close you would have to hit an approach shot from 100, 150, and 200 yards from the fairway and rough to gain half a stroke or lose half a stroke to the field. For example, from 150 yards (the typical par 4 approach shot length) hitting an approach to 7 feet will gain half a stroke, while an approach to 44 feet (15 yards) off the green will lose you half a stroke. This highlights the difficulty of long shots from the rough; a shot gaining half a stroke is only hitting to about 25 feet from 200 yards. We have defined our parameters for great shots as the top 10% of shots from that location. The threshold for these type of shots when considering approach shots and shots around the greens is about +0.40 SG and the average shot in this group gains about +0.67 SG. Poor shots are the bottom 10% of shots from that location. The threshold here is about -0.40 SG and the average shot in this group loses about -0.65 SG. As we explained above, improving an average shot to be a great shot or a poor shot to be an average shot is worth something like 50% more earnings over a season along with the accompanying benefits of World Ranking points, greater win probability, and access to stronger events. What is surprising when you break-down this data is the narrow margins that separate the best players from average players and the average players from the worst players. Below we’ve calculated the percentage of a golfer’s shots that are great and poor for each shot type and shown the leaders over 2015 to 2017. The average player will have 10% of shots in each category. For approach shots the three best by Strokes Gained have been Henrik Stenson, Paul Casey, and Adam Scott. They have collectively made a great shot 12% of the time – only 2% more than the average player! 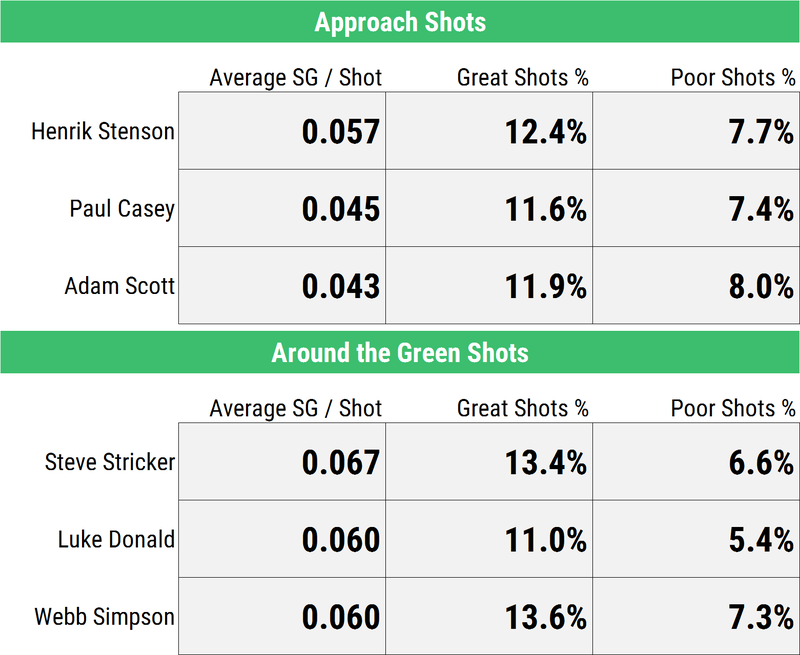 For shots around the green, Steve Stricker, Webb Simpson, and Luke Donald have been the three best and they have averaged a great shot 12.5% of the time – only 2.5% more than average. The best golfer at approach shots only hits 1-2 more great shots per event than the average player. For drives, the story is a bit different. Elite drivers of the ball like Rory McIlroy and Dustin Johnson leverage their distance and relative accuracy so that they had a great drive on 28% of holes (ranking #1 and #2) and a poor drive on only 6% (ranking #1 and #9) of holes. Phil Mickelson ranks #1 in great shots around the green (14%), but #117 (slightly below average) in avoiding poor shots. His reputation for roller-coaster results is validated. The approach shot version of Phil is Justin Thomas. He ranks #2 (12%) in terms of great shots, but also below average in avoiding poor shots. Thomas ranks #1 on Tour in wedge play this year, so his strength is generating great looks at birdie, but he tails off elsewhere. Hideki Matsuyama has been the 13th best on Tour in SG Off the Tee and he does it with consistency. He ranks 3rd best in avoiding poor drives, but only 60th best in generating those long, fairway splitting great drives. Awesome article- so how would we dissect the information Mid tournament to deduce possible future outcomes throughout said tournaments in reguards to h-h daily matchups who’s great scores are basically the product of smoke and mirrors etc. One thing that has confused me with the stat is how the cut is accounted for in the statistic. I assume the players making the cut are playing better than those missing. If that is true, and the trend continues after the cut is made, the 0 point for strokes gained will be set at a higher bar post cut than it is for the first two rounds of a normal 72 hole tournament. Yet – on the PGA Tour website, it appears to me that the strokes gained standard remains the same – the average score is the score players are measured against. Is the 0 point for strokes gained adjusted to account for the difference in the field before and after the cut? If so, how? If not, why? Nice use of data to provide insights into performance. It pays to look at whole distribution, not just the average. Awesome stuff here. What’s a good place to utilize SG data for amateurs? This is incredible insight into a very complex subject. Fascinating how little difference there is in the strokes gained from approach play (1-2 shots per tournament), yet Jordan Spieth’s success this year is in part due to being #1 in that category. From all the analysis, is there one stat where you see the biggest correlation with dollars earned? Is it strokes gained in putting from a specific range? Another interesting question would be comparing the average scratch amateur with the average PGA Tour pro, although it would be impossible to generate data from enough scratch guys. I would still be interested in your thoughts on this question. Great work and thank you for putting this together!